Now, as a practitioner myself, and experiencing great successes with my clients, I feel eternally grateful to Peggy for sharing her knowledge. 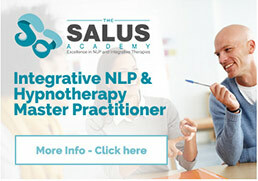 As a client of Peggy, I experienced the benefits of her integrated NLP and Hypnotherapy first hand so when I decided to add NLP/Hypnotherapy to my existing massage therapy practice it was an obvious decision to choose the course at The Salus Academy. I was not disappointed. Peggy is a fantastic teacher, and teaches with obvious passion for her subject. Her skills, knowledge and years of experience as a therapist ensure that the course is built on excellent case studies combined with extensive theoretical knowledge and resources. She ensures that all abilities and learning styles are catered for, and monitors the well-being of all her students. I feel eternally grateful to Peggy for sharing her knowledge so expertly that I am able not only help myself, but also others.